CD26/dipeptidylpeptidase IV (DPPIV) is a membrane-bound extracellular peptidase that cleaves dipeptides from the N terminus of polypeptide chains. The N terminus of chemokines is known to interact with the extracellular portion of chemokine receptors, and removal of these amino acids in many instances results in significant changes in functional activity. CD26/DPPIV has the ability to cleave the chemokine CXCL12/stromal cell-derived factor 1α (SDF-1α) at its position two proline. CXCL12/SDF-1α induces migration of hemopoietic stem and progenitor cells, and it is thought that CXCL12 plays a crucial role in homing/mobilization of these cells to/from the bone marrow. We found that CD26/DPPIV is expressed by a subpopulation of CD34+ hemopoietic cells isolated from cord blood and that these cells have DPPIV activity. The involvement of CD26/DPPIV in CD34+ hemopoietic stem and progenitor cell migration has not been previously examined. Functional studies show that the N-terminal-truncated CXCL12/SDF-1α lacks the ability to induce the migration of CD34+ cord blood cells and acts to inhibit normal CXCL12/SDF-1α-induced migration. Finally, inhibiting the endogenous CD26/DPPIV activity on CD34+ cells enhances the migratory response of these cells to CXCL12/SDF-1α. This process of CXCL12/SDF-1α cleavage by CD26/DPPIV on a subpopulation of CD34+ cells may represent a novel regulatory mechanism in hemopoietic stem and progenitor cells for the migration, homing, and mobilization of these cells. Inhibition of the CD26/DPPIV peptidase activity may therefore represent an innovative approach to increasing homing and engraftment during cord blood transplantation. The amino terminus of chemokines is known to interact with the extracellular portion of chemokine receptors. For many chemokines, removal of the N-terminal amino acids results in significant changes in receptor binding and/or functional activity (1). Consequently, proteolytic cleavage of chemokines has implications with respect to the ability of cells to be attracted and/or activated by chemokines. Chemokines have been isolated in both full-length and truncated forms (2, 3, 4, 5, 6, 7, 8). Therefore, secreted and cell surface peptidases have an involvement in the activation of cells by chemokines due to their ability to remove N-terminal amino acids. CD26/dipeptidylpeptidase IV (DPPIV)3 is a membrane-bound extracellular peptidase that cleaves dipeptides from the N terminus of polypeptide chains after a proline or an alanine; under some conditions it is capable of cleaving after other amino acids (9). It was originally described as a T cell activation molecule, but is now regarded as a non-lineage-specific Ag whose expression in hemopoietic cells is regulated by differentiation and activation. For example, CD26/DPPIV is not expressed on the surface of resting B and NK cells, but it is induced upon stimulation (10). It is possible that many chemokines encounter CD26/DPPIV during their life span, since it is also expressed on activated T lymphocytes, endothelial cells, fibroblasts, and epithelial cells, which are all involved in cell migration (11, 12). In addition, CD26/DPPIV is present in a catalytically active soluble form in plasma (13). Several other natural substrates have been identified, including the pancreatic polypeptide family (neuropeptide Y and peptide YY) and the glucagon family (glucagons, glucagon-like peptide-1, and glucagon-like peptide-2) (14). CD26/DPPIV has the ability to cleave only certain chemokines (15, 16, 17, 18, 19, 20, 21, 22, 23, 24). This is due to the fact that only some chemokines contain the essential N-terminal X-Pro or X-Ala motif preferred by CD26/DPPIV, and even then some of these chemokines resist cleavage. The in vitro ability of CD26/DPPIV to truncate chemokines, and thereby affect function, is highly dependent on dosage and incubation time. This would suggest that not all chemokines that can be cleaved serve as in vivo substrates. A recent study suggests that CD26/DPPIV has selectivity toward stromal cell-derived factor 1α (SDF-1α)/CXCL12 and macrophage-derived chemokine/CCL22 compared with other chemokines able to be cleaved by CD26/DPPIV (25). This study examined the steady state kinetics of truncation between chemokines that had been previously reported to have altered activity ability after treatment with CD26/DPPIV (CCL3b, CCL5, CCL11, CCL22, CXCL9, CXCL10, CXCL11, and CXCL12). Truncation of CXCL12/SDF-1α occurs after the proline at position 2 (Fig. 1⇓) (25). Amino acid sequence of human CXCL12/SDF-1α (accession no. XP_005815). CD26/DPPIV cleaves CXCL12/SDF-1α after proline in position 2. CXCL12/SDF-1α chemoattracts human T lymphocytes. CD26/DPPIV is reported to reduce the ability of T lymphocyte cell lines with endogenously expressed and transformed CD26/DPPIV to migrate in response to CXCL12/SDF-1α and exhibit anti-HIV-1 activity compared with non-CD26/DPPIV-expressing cells (19). In addition, N-terminal-truncated CXCL12/SDF-1α, lacking the first two amino acids, was reported to lack chemotactic and anti-HIV-1 activities. This suggests that CD26/DPPIV down-regulates CXCL12/SDF-1α activation of the CXCR4 receptor in T lymphocytes by cleaving the N-terminal dipeptide of CXCL12/SDF-1α. CXCL12/SDF-1α chemoattracts human CD34 + cells and stem and progenitor cell populations within this phenotype (26, 27, 28), and it is considered an important component of the migration, homing, and mobilization of these important cells (28). However, very little is known about CD26/DPPIV expression in CD34+ hemopoietic cells. What is known is that CD26/DPPIV is expressed in peripheral blood samples from breast cancer patients after mobilization with G-CSF; some mobilized CD34+ cells expressed CD26/DPPIV and possessed peptidase activity (29). The expression of CD26/DPPIV in nonmobilized CD34+ cells or other sources of CD34+ cells is not known. More importantly, the functional activity of CD26/DPPIV on CD34+ cells for CXCL12/SDF-1α and its implications for migration and homing of hemopoietic stem/progenitor cells has not yet been addressed. Cord blood is a functional source of transplantable hemopoietic stem/progenitor cells (30, 31, 32). Herein we present evidence that CD26/DPPIV is expressed by a subpopulation of CD34+ hemopoietic cells isolated from cord blood. In addition, CD26+/CD34+ cord blood cells possess DPPIV peptidase activity. Functional studies show that the N-terminal-truncated CXCL12/SDF-1α produced by treatment with DPPIV lacks the ability to induce the migration of CD34+ cord blood cells, and the granulocyte-macrophage (CFU-GM) and multipotential (CFU-GEMM) progenitor cells within this population and acts to inhibit normal CXCL12/SDF-1α-induced migration. Finally, specifically inhibiting the endogenous CD26/DPPIV activity on CD34+ cells, by treatment with diprotin A, enhances the chemotactic response of these cells to CXCL12/SDF-1α, findings that may be of future clinical trial utility. Normal human cord blood mononuclear cells were collected with institutional approval and were isolated by density gradient centrifugation over Ficoll-Paque Plus (Amersham Pharmacia Biotech, Piscataway, NJ). CD34+ cells were isolated from mononuclear cells using direct CD34+ magnetic bead separation over two sequential columns (Miltenyi Biotec, Auburn, CA). CD34+ cells (97.6 ± 0.76% pure) were then used immediately. CD26/DPPIV cell surface expression was measured by multivariant flow cytometry. Isolated CD34+ cord blood cells were stained with fluorochrome-conjugated mAbs to CXCR4, CD26, and CD34 (BD PharMingen, San Diego, CA) in accordance with the manufacturer’s specifications and then counted by flow cytometric analysis. The conjugates used were CD26-FITC, CXCR4-PE, and CD34-PerCP-Cy5.5. The staining protocol was as follows. Cells were first washed in PBS/pennicillin/streptomycin/1% BSA and resuspended in 100 μl of PBS/pennicillin/streptomycin/1% BSA containing the appropriate Abs. Samples were mixed and incubated at 4°C in the dark for 40 min. The cells were then washed twice in PBS/pennicillin/streptomycin/1% BSA and fixed in PBS/1% paraformaldehyde for later flow cytometric analysis. One hundred thousand events were accumulated for each analysis. Six samples were analyzed separately, and then the data were averaged for statistical analysis. Data are presented as the mean ± SEM, and comparisons were made using two-tailed Student’s t test. The DPPIV activity of CD26+/CD34+ sorted cord blood cells was measured in 96-well microplates using the chromogenic substrate Gly-Pro-p-nitoanilide (Gly-Pro-pNA; Sigma-Aldrich, St. Louis, MO) (33, 34). Proteolytic activity was determined by measurement of the amount of nitroanilide (pNA) formed in the supernatant at 405 nm. One thousand CD26+/CD34+ cord blood cells per well in the 96-well flat-bottom plate were incubated at 37°C with 4 mM Gly-Pro-pNA in 100 μl of PBS buffer (pH 7.4) containing 10 mg/ml of BSA. Absorbance was measured at 405 nm on a microplate spectrofluorometer (SpectraMax 190; Molecular Devices, Menlo Park, CA) every 2 min, and the picomoles of pNA formed was calculated by comparison with a pNA standard curve. The results were plotted as picomoles of pNA per minute, and the slope was calculated at the linear portion of the curve giving a measure of DPPIV activity expressed as picomoles per minute per 1000 cells. The activity of CD26+/CD34+ cells was compared with that of CD26+/CD3+ peripheral blood T lymphocytes. Tests were run using four separate CD26+/CD34+ cord samples (n = 2–7 for each sample) and two separate CD26+/CD3+ peripheral blood samples (n = 4 for each sample); cell-free blanks, substrate-free blanks, as well as CD26− cells were run in parallel. Data are presented as the mean ± SEM of all tests (total n = 15 for cord blood samples and total n = 8 for peripheral blood samples). Chemotaxis assays were performed using 96-well chemotaxis chambers (NeuroProbe, Gaithersburg, MD) in accordance with the manufacturer’s instructions as described previously with minor variations (35). Briefly, 0, 6.25, 12.5, 25, 50, 100, 200, and 400 ng/ml CXCL12/SDF-1α were added to 300 μl of RPMI without phenol medium supplemented with 10% FBS in the lower chamber. Twenty thousand fluorescence-tagged (4 μg/ml of Calcein/AM; Molecular Probes, Eugene, OR) isolated CD34+ cord blood cells in 50 μl of medium were added to the upper side of the membrane (5.7 mm diameter, 5 μm pore size, polycarbonate membrane). Total cell migration was obtained by measuring fluorescence (excitation, 485 nm; emission, 530 nm) on a microplate spectrofluorometer and calculating cell number in the lower well by comparison with a cell number standard curve after 2 or 4 h of incubation at 37°C in 5% CO2. The percent migration was calculated by dividing the number of the cells in the lower well by the total cell input multiplied by 100 and subtracting random migration (always <5%) to the lower chamber without chemokine presence. Three samples were analyzed separately in triplicate, and then the data were averaged for statistical analysis. Data ire presented as the mean ± SEM, and comparisons were made using two-tailed Student’s t test. Inhibition of endogenous CD26/DPPIV activity on CD34+ cells was accomplished by pretreatment of cells with 5 mM diprotin A (Peptides International, Louisville, KY) for 15 min at 37°C. Diprotin A was allowed to remain in the chemotaxis chamber during the assay. Chemotaxis assays were performed with and without diprotin A in conjunction with a CXCL12/SDF-1α dose response between 0 and 400 ng/ml. In addition, treated and untreated sorted CD26−/CD34+ cord blood cells were examined and compared with the diprotin A-treated and -untreated total CD34+ cord blood cells. The N-terminal-truncated CXCL12/SDF-1α (CXCL12/SDF-1α3–68) was produced by treatment with DPPIV (Enzyme Systems Products, Livermore, CA) for 18 h at 37°C in PBS, pH 7.4. Mass spectroscopy (matrix-assisted laser desorption ionization after V8 digestion) was performed on CXCL12/SDF-1α and CXCL12/SDF-1α3–68 and the efficiency of the DPPIV digestion was 100% as determined by a complete shift from a 1831.889 peak (corresponding to the KPVSLSYRCPCRFFE fragment of CXCL12/SDF-1α) to a 1636.730 peak (corresponding to the VSLSYRCPCRFFE fragment of CXCL12/SDF-1α3–68) after treatment with DPPIV. The CXCL12/SDF-1α sample had no detectable peak at 1636.730, and the CXCL12/SDF-1α3–68 sample had no detectable peak at 1831.889. Chemotaxis assays using CXCL12/SDF-1α3–68 were performed using 100 ng/ml chemokine. Chemotaxis assays examining the inhibitory effect of CXCL12/SDF-1α3–68 used 100 ng/ml of CXCL12/SDF-1α and a pretreatment of 100 ng/ml CXCL12/SDF-1α3–68 for either 15 or 45 min. Fifteen minutes of pretreatment represents the minimum setup time for the chemotaxis assay after addition of CXCL12/SDF-1α3–68 to the system. An additional 30-min pretreatment (45 min total) was assayed to establish whether CXCL12/SDF-1α3–68 had the ability to competitively inhibit the function of normal CXCL12/SDF-1α. Additional chemotaxis assays for purposes of cell collection following migration were performed using 24-well Transwell chambers (Corning, Corning, NY) as previously described with minor variations (36). Two-hundred thousand isolated CD34+ cells in 200 μl of RPMI supplemented with 10% FBS were placed in the upper chamber above the membrane (6.5 mm diameter, 5 μm pore size, polycarbonate membrane). Zero, 100, or 200 ng/ml CXCL12/SDF-1α was added to 1 ml of RPMI supplemented with 10% FBS in the lower chamber. The total number of cells in the lower chamber after 4 h of incubation at 37°C in 5% CO2 was obtained by counting using a hemocytometer. Input and migrated cells were collected from 24-well chemotaxis assays, and 1000 cells were plated for colony formation by CFU-GM and CFU-GEMM (37). Cells were plated for colony formation in 1% methylcellulose culture medium with 30% FBS, 1 U/ml recombinant human erythropoietin, 100 U/ml recombinant human GM-CSF, 100 U/ml recombinant human IL-3, and 50 ng/ml recombinant human Steel factor (stem cell factor). Cells were scored after 14-day incubation at 5% CO2 and 5% O2. Since CFU-GM and CFU-GEMM, but not erythroid progenitor (BFU-E), are detected when this combination of growth factors is used to stimulate colony formation of cord blood progenitor cells (38), we did not assess BFU-E chemotaxis. The absolute number of cells in the lower chamber that give rise to a specific colony type was calculated by dividing the number of colonies formed in one plate by either 500 or 1000 and multiplying this number by the total number of cells in the lower chamber as determined previously. The percent migration was then calculated by dividing the number of cells in the lower well that gave rise to a specific colony type by the total cell input of that specific colony type, multiplying by 100, and subtracting random migration (always <1.0%) to the lower chamber without chemokine presence. Three samples were analyzed separately in triplicate, and then the data were averaged for statistical analysis. Data are presented as the mean ± SEM, and comparisons were made using two-tailed Student’s t test. CD26/DPPIV cell surface expression was measured by multivariant flow cytometry using fluorochrome-conjugated mAbs to CXCR4, CD26, and CD34. CD34+ cord blood cells are 8.6 ± 2.1% CD26+ (mean ± SEM; n = 12; Fig. 2⇓). Simultaneous examination of CXCR4 expression in these cells reveals that, on the average, 82.8 ± 4.9% of CD26+/CD34+ cells express CXCR4 (n = 12; Fig. 3⇓, A–C). Similarly, 81.9 ± 3.1% of CD26−/CD34+ cells are CXCR4+ (n = 12; Fig. 3⇓, A–C). In addition, it was noted that CD26+/CD34+ cells have a higher level of CXCR4 expression than CD26−/CD34+ cells, as measured by changes in mean fluorescence intensity (MFI; MFI = 118.8 ± 16.2 vs MFI = 71.7 ± 5.8, respectively; n = 12; p = 0.015; Fig. 3⇓D). Expression of CD26 on CD34+ cells. Multivariant flow cytometry was performed on fresh human CD34+ isolated cord blood cells using the fluorochrome-conjugated mAbs. Representative isotype (A) and sample (B) CD26-FITC vs CD34-PerCP-Cy5.5 dot plots are shown. Data obtained from 12 samples indicate that a small, but significant, percentage of CD34+ cord blood cells expresses CD26/DPPIV (C, bar graph). 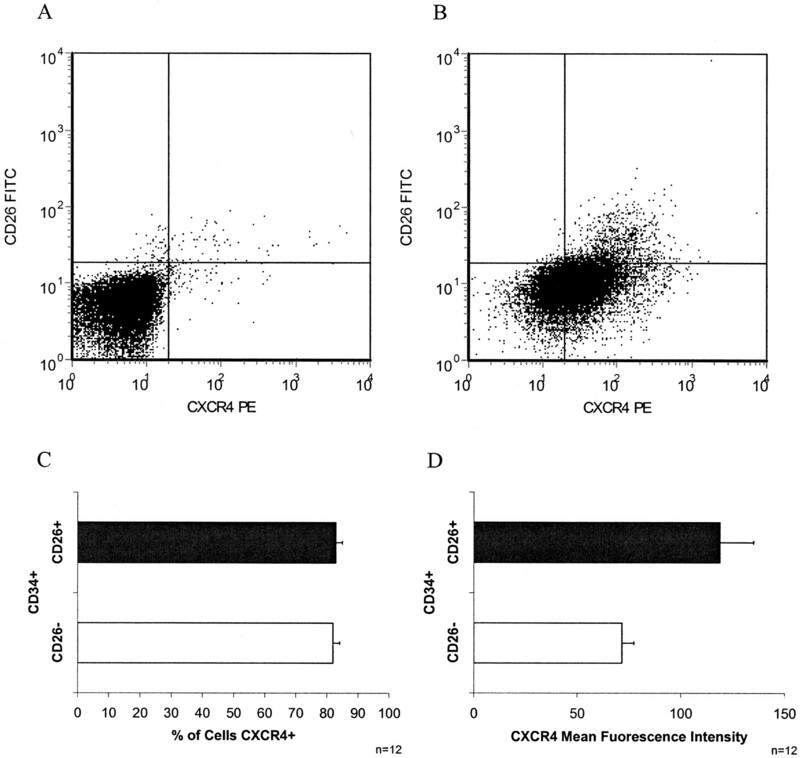 Expression of CXCR4 on CD34+ cells expressing or lacking CD26. Human CD34+ isolated cord blood samples were analyzed for the expression of CD26, CXCR4, and CD34 by multivariant flow cytometry using CD26-FITC, CXCR4-PE, and CD34-PerCP-Cy5.5 mAbs. Representative isotype (A) and sample (B) CD26-FITC vs CXCR4-PE dot plots are shown. Data obtained from 12 samples indicate that both CD26+/CD34+ and CD26−CD34+ cord blood cells express CXCR4 (C). A small, but significant, CD26+/CD34+ population of cells expresses CXCR4+ (C). The majority of CD34+ cells are CXCR4+/CD26− (B). CD26+/CD34+ cells express 1.7-fold higher levels of surface CXCR4 compared with CD26−/CD34+ cells as measured by the MFI (D). Having shown that a subpopulation of CD34+ cells existed in which CD26 was expressed, we then set out to show that thispopulation of cells had DPPIV activity. Using the chromogenic substrate Gly-Pro-pNA, we monitored the production of pNA at 405 nm produced by DPPIV cleavage. The results of this assay were plotted as picomoles of pNA produced per minute (Fig. 4⇓A), and the slope was calculated at the linear portion of the enzymatic curve giving a measure of DPPIV activity expressed as units per 1000 CD26+/CD34+ cells, where 1 U = 1 pmol pNA/min. CD26+/CD34+ cord blood cells have DPPIV activity, and it was determined to be 43.35 U/1000 cells (n = 15; Fig. 4⇓A). This is less than the activity recorded for CD26+/CD3+ peripheral blood T lymphocytes (113.30 U/1000 cells; n = 8; Fig. 4⇓C). The DPPIV activity of the total CD34+ cord blood cell population (15.45 U/1000 cells; n = 8; Fig. 4⇓B) was less than the activity of CD26+/CD3+ peripheral blood T lymphocytes and less than the activity of CD26+/CD34+ cord blood cells. Neither CD26−/CD34+ cells nor CD26−/CD3+ peripheral blood T lymphocytes exhibited measurable DPPIV activity. DPPIV activity of CD34+ cells. The DPPIV activities of CD26+/CD34+ cord blood cells and total CD34+ cord blood cells were measured and compared with that of CD26+/CD3+ T cells isolated from peripheral blood. Using the chromogenic substrate Gly-Pro-pNA, the production of pNA by DPPIV cleavage was monitored. The results are plotted as picomoles of pNA produced per minute, and the slope was calculated at the linear portion of the enzymatic curve giving a measure of DPPIV activity expressed as units per 1000 cells, where 1 U = 1 pmol of pNA/min. CD26+/CD34+ cord blood cells (A) and total CD34+ cord blood cells (B) possess DPPIV activity. Both activities are less than that of CD26+/CD3+ peripheral T cells (C). CD26−/CD34+ cells were also tested, but showed no measurable activity. Chemotaxis assays were performed to test the functional role of CD26/DPPIV in CD34+ hemopoietic cell migration. Normal CD34+ cell migration, after incubation at 37°C for 2 h (Fig. 5⇓A) or 4 h (Fig. 5⇓B), shows a dose response to CXCL12/SDF-1α. Migratory response of CD34+ cells. Chemotaxis assays were performed comparing diprotin A-treated (▪) and untreated (♦) CD34+ cord blood cells. Normal CD34+ cell migration (♦) shows a dose response to CXCL12/SDF-1α after incubation at 37°C for 2 h (A) or 4 h (B). Treatment of CD34+ cells with 5 mM diprotin A (▪) enhanced the migratory response of CD34+ cells to CXCL12/SDF-1α after 2 h (A, n = 9, p < 0.01) and 4 h (B, n = 6, p < 0.01). When comparing treated vs untreated CD24+ cells, treatment with 5 mM diprotin A resulted in a 2-fold increase in total CD34+ cord blood cell migration in response to 200 and 400 ng/ml of CXCL12/SDF-1α at both 2 h (C) and 4 h (D). When the concentration of CXCL12/SDF-1α was lowered to 50 ng/ml, the increase in migration was 5-fold (C and D). Sorted CD26−/CD34+ cells (▴) were observed to have a greater migratory response than total CD34+ cells (♦) at both 2 h (A, n = 6, p < 0.01) and 4 h (B, n = 6, p < 0.01). CD26−/CD34+ cells (▴) were not significantly different from the CD34+ cells treated with diprotin A (▪) (A and B). Treatment of CD26−/CD34+ cells with diprotin A (•) had no effect on their migration compared with untreated CD26−/CD34+ cells (▴). Treatment with 5 mM diprotin A (Ile-Pro-Ile) enhanced the migratory response of CD34+ cells to CXCL12/SDF-1α at both 2 h (n = 9; p < 0.01; Fig. 5⇑A) and 4 h (n = 6; p < 0.01; Fig. 5⇑B). This increase represents a 2-fold increase in total CD34+ cord blood cell migration in response to 200 and 400 ng/ml CXCL12/SDF-1α at both 2 h (Fig. 5⇑C) and 4 h (Fig. 5⇑D). When the concentration of CXCL12/SDF-1α was lowered to 50 ng/ml, the increase in migration was 5-fold (Fig. 5⇑, C and D). Sorted CD26−/CD34+ cells had a greater migratory response than total CD34+ cells at both 2 h (n = 6; p < 0.01; Fig. 5⇑A) and 4 h (n = 6; p < 0.01; Fig. 5⇑B). CD26−/CD34+ cells were not significantly different from CD34+ cells treated with diprotin A (Fig. 5⇑, A and B). Treatment of CD26−/CD34+ cells with diprotin A had no effect on their migration compared with untreated CD26−/CD34+ cells (Fig. 5⇑, A and B). An increased 4-h migration of cord blood CFU-GM and CFU-GEMM was also observed after treatment with diprotin A (n = 3; p < 0.01; Fig. 6⇓). When comparing treated vs untreated CFU-GM, treatment resulted in 3.2 ± 0.4- and 2.4 ± 0.3-fold increases in cell migration in response to 200 and 400 ng/ml of CXCL12/SDF-1α, respectively. 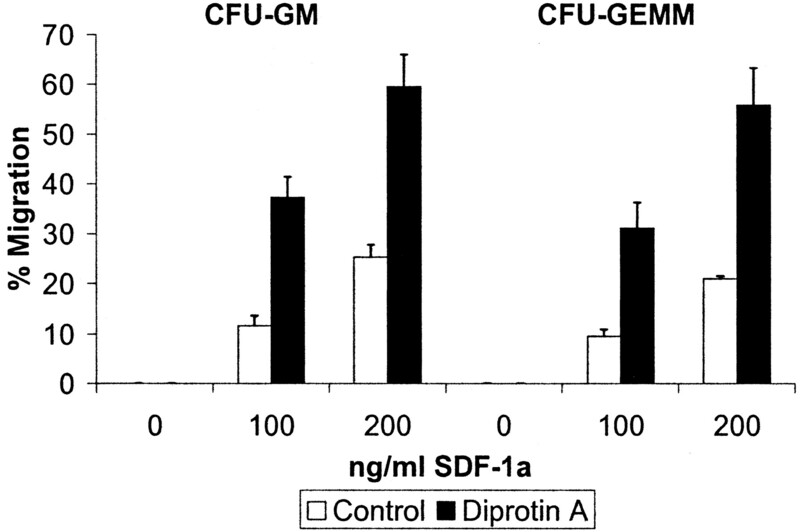 When comparing treated vs untreated CFU-GEMM, treatment with 5 mM diprotin A resulted in 3.3 ± 0.5- and 2.7 ± 0.4-fold increases in cell migration in response to 200 and 400 ng/ml CXCL12/SDF-1α, respectively. 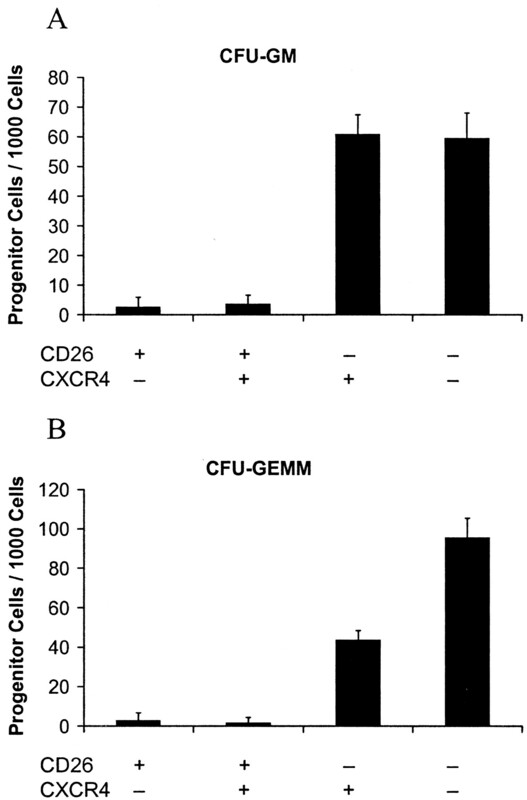 Migratory response of CD34+ CFU-GM and CFU-GEMM. Chemotaxis assays were performed comparing treated (▪) and untreated (□) cord blood cells. Input and migrated cells underwent colony formation assays. Normal cell migration (□) shows a dose response to CXCL12/SDF-1α after incubation at 37°C for 4 h. Treatment of CD34+ cells with 5 mM diprotin A (▪) enhanced the migratory response of CD34+ cells to CXCL12/SDF-1α (n = 3, p < 0.01). The N-terminal-truncated CXCL12/SDF-1α (CXCL12/SDF-1α3–68) produced by treatment with DPPIV did no induce the migration of CD34+ cells after 2 h (n = 9; p < 0.01; Fig. 7⇓A) or 4 h (n = 9; p < 0.01; Fig. 7⇓B). In addition, 15-min pretreatment with CXCL12/SDF-1α 3–68(3–68) blocked the migratory response to normal CXCL12/SDF-1α (n = 9, 2 h, p = 0.06, Fig. 7⇓A; 4 h, p = 0.07, Fig. 7⇓B). A 15-min pretreatment of CD34+ cord blood cells with 100 ng/ml of CXCL12/SDF-1α3–68 followed by addition to a chemotaxis chamber containing 100 ng/ml of CXCL12/SDF-1α reduced the percent migration after 2 h from 5.6 ± 1.2 to 2.9 ± 0.9% and after 4 h from 13.3 ± 1.5 to 7.3 ± 0.7%, representing 48 and 45% losses in migration, respectively. Pretreatment for 45 min with CXCL12/SDF-1α3–68 almost completely eliminated the chemotactic response to normal CXCL12/SDF-1α (n = 9, 2 and 4 h, p < 0.01, Fig. 7⇓). The 45-min pretreatment of CD34+ cord blood cells with 100 ng/ml of CXCL12/SDF-1α3–68 followed by addition to a chemotaxis chamber containing 100 ng/ml of CXCL12/SDF-1α reduced the percent migration after 2 h to 0.4 ± 0.7% and after 4 h to 1.5 ± 0.8%, representing 93 and 89% losses in percent migration, respectively. Migratory response of CD34+ cells to N-terminal truncated CXCL12/SDF-1α. Chemotaxis assays using CD34+ cord blood cells were performed comparing the normal CXCL12/SDF-1α and the N-terminal-truncated form, CXCL12/SDF-1α3–68. CXCL12/SDF-1α3–68 did not induce the migration of cells compared with CXCL12/SDF-1α at 2 h (A, p < 0.01, n = 9) or 4 h (B, p < 0.01, n = 6). 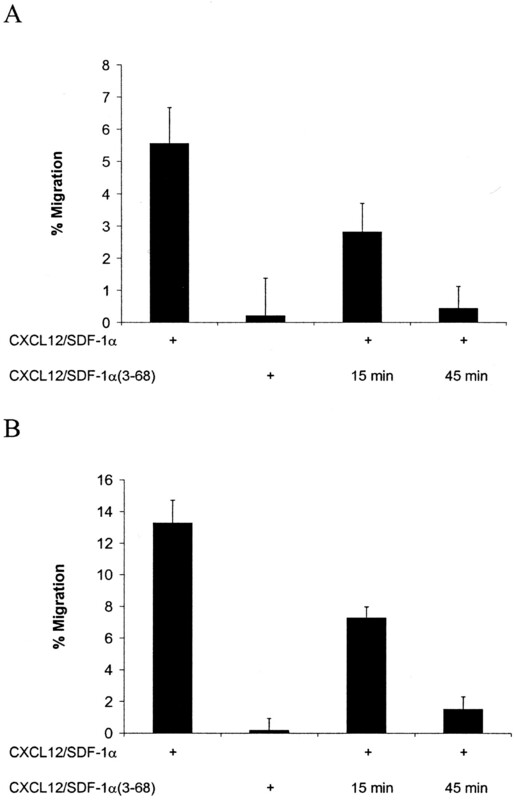 Preincubation of cells for 15 or 45 min with CXCL12/SDF-1α3–68 inhibited the normal CXCL12/SDF-1α-induced migration of CD34+ cells in a time-dependent manner (A and B; 15 min, p < 0.02; 45 min, p < 0.01). To examine the progenitor cell composition of CD26+ and CD26− cells, CD34+ cells were sorted based on CD26 and CXCR4 expressions. Colony formation assays were then performed on the resulting populations of CD34+ cells, which were comprised of CD26+/CXCR4−, CD26+/CXCR4+, CD26−/CXCR4+, and CD26−CXCR4− subpopulations. Significantly fewer CFU-GM (Fig. 8⇓A) and CFU-GEMM (Fig. 8⇓B) progenitors were observed in the CD26+ population of cells compared with the CD26− population regardless of CXCR4 expression (n = 3, p < 0.01). Specifically, 2.6 ± 3.3, 3.7 ± 2.9, 60.8 ± 6.6, and 59.4 ± 8.6 CFU-GM progenitors/1000 cells were detected in the CD26+/CXCR4−, CD26+/CXCR4+, CD26−/CXCR4+, and CD26−CXCR4− subpopulations, respectively (Fig. 8⇓A). Some 2.8 ± 4.0, 1.7 ± 2.7, 43.7 ± 4.8, and 95.6 ± 9.9 CFU-GEMM progenitors/1000 cells were detected in the CD26+/CXCR4−, CD26+/CXCR4+, CD26−/CXCR4+, and CD26−CXCR4− subpopulations, respectively (Fig. 8⇓B). 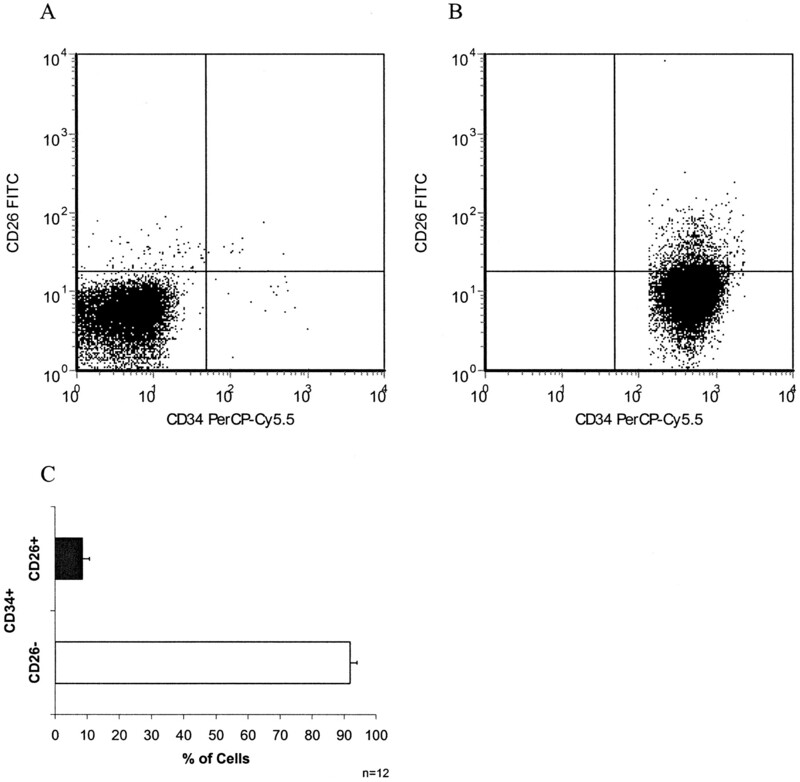 Progenitor cell composition of CD34+ cells sorted based on CD26 and CXCR4 expression. Colony formation assays were performed on CD26+/CXCR4−, CD26+/CXCR4+, CD26−/CXCR4+, and CD26−CXCR4− sorted CD34+ cells. Significantly fewer CFU-GM (A) and CFU-GEMM (B) were observed in the CD26+ population of cells compared with the CD26− population regardless of CXCR4 expression (n = 3, p < 0.01). CD26/DPPIV has the ability to cleave SDF-1α/CXCL12 after the proline at position 2 (25). Removal of the N-terminal amino acids results in significant changes in the functional activity of many chemokines (1). Given that CD26/DPPIV reduces the ability of T lymphocytes to migrate in response to CXCL12/SDF-1α compared with that of non-CD26/DPPIV-expressing cells (19), the involvement of CD26/DPPIV in regulating the migration of CD34+ cells induced by CXCL12/SDF-1α was examined. We first tested the expression of CD26/DPPIV in CD34+ hemopoietic cells isolated from cord blood. Multivariant flow cytometry revealed that a low, but highly significant, subpopulation of CD34+ cells expresses CD26/DPPIV. It was also discovered that CXCR4, the receptor for CXCL12/SDF-1α, is expressed in both the CD26+ and CD26− populations of CD34+ cells. This data define two populations of cells that exist within cord blood. The majority of cells that are CD34+ are also CXCR4+/CD26−. A much smaller, but significant, population of CD34+ cells is CXCR4+/CD26+. This suggests that either CD26/DPPIV regulates the activity of a small portion of CD34+ hemopoietic cells or that, as we believe, the small CD26+ subpopulation has the ability to regulate the entire population of CD34+ hemopoietic cells. Having shown that a subpopulation of CD34+ cells existed that expressed CD26, we then tested the DPPIV activity of this population of cells using the chromogenic substrate Gly-Pro-pNA. Based on the production of pNA by DPPIV cleavage it was shown that CD26+/CD34+ cells possess DPPIV activity equivalent to 43.3 U/1000 cells (1 U = 1 nM pNA/min). The total CD34+ cell population has an activity equal to 15.4 U/1000 cells, about one-third that of sorted CD26+. DPPIV activity in T lymphocytes has previously been established (39). We tested sorted peripheral blood CD26+/CD3+ T lymphocytes and showed their DPPIV activity to be equivalent to 113.3 U/1000 cells. As a control we also tested CD26− cell populations and were unable to detect DPPIV activity in this assay. These data establish that not only do CD34+ cord blood cells express the extracellular peptidase CD26/DPPIV in an active form, but that the activity of CD26+/CD34+ cells, on a per cell basis, is a little more than one-third that of CD26+ T lymphocytes. Lower levels of CD26/DPPIV activity observed in CD26+/CD34+ cells suggest that they may have a decreased negative regulation of CXCL12/SDF-1α on a per cell basis compared with CD26+/CD3+ T lymphocytes, but probably have the ability to significantly negatively regulate CXCL12/SDF-1α by N-terminal truncation. Since the involvement of CD26/DPPIV in CD34+ hemopoietic cell migration had never been previously examined in CD34+ cells from any source, chemotaxis assays were performed at 2 and 4 h points using CD34+ cord blood cells to test the functional role of CD26/DPPIV. Treatment of CD34+ cord blood cells with the CD26/DPPIV inhibitor, diprotin A, enhanced the migratory response of these cells 2-fold at high concentrations (200 and 400 ng/ml) of CXCR4/SDF-1α. This enhancement was roughly equivalent to the migratory response to SDF-1α observed in CD26−/CD34+ cells. This suggests that treatment with the CD26/DPPIV inhibitor blocks the majority of DPPIV activity expressed in the total CD34+ population of cord blood cells. Treatment of CD26−/CD34+ cells with diprotin A did not affect the migration of these cells, suggesting that the action of the inhibitor is CD26/DPPIV specific. By colony formation assay we showed that the immature, highly proliferative subsets of CFU-GM and CFU-GEMM within this population of CD34+ cells (38) were also enhanced in their migratory response to CXCL12/SDF-1α after treatment of cells with diprotin A. Increases in migration of CFU-GM of 3.2- and 2.4-fold in response to 200 and 400 ng/ml CXCL12/SDF-1α, respectively, were observed. Increases in migration of CFU-GEMM of 3.3- and 2.7-fold, respectively, were also observed. 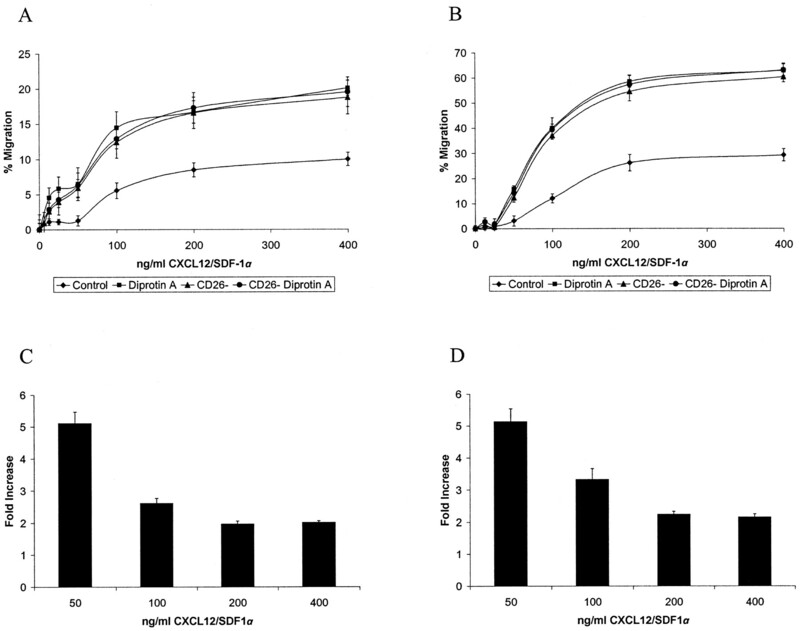 Comparison of CD34+ cell migration induced by the normal CXCL12/SDF-1α to the truncated form, CXCL12/SDF-1α3–68, produced by DPPIV treatment showed an inability of CXCL12/SDF-1α3–68 to induce migration. In addition, CXCL12/SDF-1α3–68 acts as an antagonist, resulting in the reduction of CD34+ cell migratory response to normal CXCL12/SDF-1α after 15-min pretreatment, representing the minimal setup time, and resulting in an almost complete loss of migratory response to normal CXCL12/SDF-1α after 45-min pretreatment. The additional 30-min pretreatment (45 min total) suggests that the inactive CXCL12/SDF-1α3–68 still has the ability to bind CXCR4 and competitively inhibit normal activation by CXCL12/SDF-1α. Similar studies using pretreatment of cells with normal CXCL12/SDF-1α have shown that CXCR4 receptor can be desensitized, reducing subsequent treatments with CXCL12/SDF-1α (27). These data suggest that the N-terminal-truncated form of CXCL12/SDF-1α has no chemotactic activity toward CD34+ cord blood cells, but still has the ability to bind the CXCR4 receptor and block migration of cells induced by normal CXCL12/SDF-1α. Importantly, this information shows that even though a small percentage of CD34+ cells are expressing CD26/DPPIV on their surface, the migratory response of the total population of CD34+ cells to CXCL12/SDF-1α can be altered greatly by inhibition of DPPIV activity. This suggests that CD26/DPPIV indirectly has the ability to negatively regulate CXCL12/SDF-1α signaling through the CXCR4 receptor in CD34+ hemopoietic cells by cleaving local pools of CXCL12/SDF-1α. Therefore, CD26/DPPIV expressed on the surface of any one cell or subpopulation of CD34+ hemopoietic stem/progenitor cells collectively has the ability to self-regulate not only their own activation/migration by CXCL12/SDF-1α, but also the activation/migration of surrounding CD34+ hemopoietic stem/progenitor cells. To address the question of what portion of progenitor cells expresses CD26/DPPIV, colony formation assays were performed on sorted populations of CD34+ cord blood cells. The CD26+/CXCR4− and CD26+/CXCR4+ populations of cells formed much fewer CFU-GM and CFU-GEMM progenitors compared with the CD26−/CXCR4+ and CD26−/CXCR4− populations of cells. The majority of progenitors were within the CD26− population of cells, and CD26+ cells contained very few progenitors regardless of their CXCR4 expression status. These data support the concept that a small subpopulation of CD26+ cells regulates the response of the entire population of hemopoietic stem/progenitor cells to CXCL12/SDF-1α. CXCL12/SDF-1α is believed to be an important chemokine involved in the homing of hemopoietic stem cells to the bone marrow (32, 40, 41). CD26/DPPIV cleavage of CXCL12/SDF-1α results in an N-terminal-truncated CXCL12/SDF-1α. This cleaved form of CXCL12/SDF-1α lacks migratory ability and inhibits the migratory ability of normal CXCL12/SDF-1α. In this way it is possible for CD26/DPPIV expressed on a small population of cells to inhibit the migration of all CD34+ hemopoietic cells within a local pool of cells. This process of CXCL12/SDF-1α cleavage by CD26/DPPIV may represent a novel regulatory mechanism in hemopoietic stem cells for the migration, homing, and mobilization of these cells. Suppressing the inhibitory effects of CD26/DPPIV can be viewed as a potential mechanism for increasing stem cell migration and therefore a novel therapeutic approach for increasing the homing and engraftment of hemopoietic stem and progenitor cells to the bone marrow. Cord blood has been used as a transplantable source of hemopoietic stem and progenitor cells since our initial reports (30, 31, 32). However, to date its use in the majority of cases has been confined to children. The amount of cord blood collected appears more limiting for use in adults. To counter this problem, many laboratories have evaluated ex vivo stem cell expansion procedures, but the initial results are discouraging (32). Since not all stem cells home to the appropriate marrow niches necessary for engraftment, an alternative means to enhance the efficiency of cord blood transplantation for adults is to enhance the efficiency of stem cell homing (32). In this context, inactivation of CD26/DPPIV activity on CD26+/CD34+ cord blood cells may be one means to accomplish this clinically important functional scenario for more effective stem cell homing. It has been proposed by others that direct degradation of CXCL12/SDF-1α by proteolytic enzymes, including neutrophil elastase and cathepsin G, may play a role in hemopoietic stem cell mobilization (40). It is also possible that increasing the expression and/or activity of endogenous CD26/DPPIV or augmenting the level of CD26/DPPIV activity with exogenous peptidase could be a viewed as an alternative method of enhancing hemopoietic stem cell mobilization. ↵1 This work was supported by U.S. Public Health Service Grants R01HL67384, R01HL56416, and R01DK53674 (to H.E.B.) and National Institutes of Health T32 Training Program DK07519 (to H.E.B. and K.W.C.). ↵3 Abbreviations used in this paper: DPPIV, dipeptidylpeptidase IV; CFU-GEMM, multipotential progenitor cells; CFU-GM, granulocyte-macrophage progenitor cells; MFI, mean fluorescence intensity; pNA, nitroanilide; SDF-1α, stromal cell-derived factor 1α. Broxmeyer, H., F. Smith. 1999. Cord blood stem cell transplantation. S. J. Forman, and K. G. Blume, and E. D. Thomas, eds. Hematopoietic Cell Transplantation 431 Blackwell Science, Oxford, U.K., and Malden, MA. Cooper, S., and H. E. Broxmeyer. 1996. Measurement of interleukin-3 and other hematopoietic growth factors, such as GM-CSF, G-CSF, M-CSF, erkythropoietin and the potent co-stimulating cyktokines steel factor and FLt-3 ligand. In Current Protocols in Immunology. K. A. Coligan, D. H. Margulies, E. M. Shevach, E. Strober, and R. Coico, eds. John Wiley & Sons, New York, p. 6.4.1.